Invisalign is the invisible alternative to traditional braces. It is easy to use and gives you more flexibility. 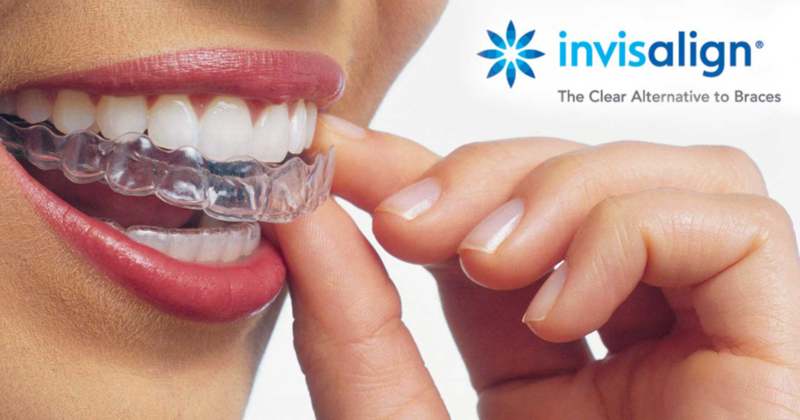 Invisalign is a company that provides clear, plastic trays that fit over your teeth. They produce a series of trays that slightly shift your teeth over time. Together with their software to analyse and map out your path to a perfect smile, invisalign® provides dental professionals with an alternative to traditional metal braces. invisalign® is a popular choice for actors because they work in front of a camera or are constantly portraying characters that probably don’t wear braces. The flexibility of being able to take the trays out allows them to straighten their teeth without anyone knowing. When discipline is the main issue, traditional braces are usually the better choice. Keep in mind that if you’re not wearing your invisalign®, your teeth are not being straightened. A typical 6 month case can take years for people that have a hard time keeping them in. The cost of invisalign® is comparable to braces. You will still be going in to visit the orthodontist on a regular basis for progress checks and adjustments. Insurance covers invisalign® as it does traditional braces so there isn’t a big difference there. Generally every case is calculated based on the necessary treatment and the time it will take to complete the treatment. The lab fees that invisalign® charges are substantial but on the upside, because invisalign® is handling most of the adjustments in their labs, your doctor visit doesn’t take as long. Of course it’s not for everybody, but most cases can be treated by invisalign®. If you don’t want to be seen with braces then go with invisalign®. Sometimes braces can take less time and get better movement out of your teeth for better results. If your teeth aren’t that crooked and you just need a couple of them moved a bit, invsialign® could get the job done in no time at all. To know if it’s really going to be beneficial for you, visit your doctor to get an objective opinion about your teeth and the best way to get your smile in good shape. How long do I have to wear the trays? You’ll be wearing the trays for the rest of your life so take good care of them. Brushing them after taking them out is a good habit. This allows you to remove any saliva or bacteria before it dries. Dried saliva is one of the biggest causes of bad breath and will make your invisalign® trays unbearable if you don’t keep them clean. You can also put them in a solution and vibrate them in an ultrasonic cleaner (like the ones made for dentures) to clean them if they’re getting bad. Visit your dentist and they can clean them in the ultrasonic cleaner for you for free.